It is being reported that investigators are searching a snow making pond (Map) about a quarter of a mile from the Cranmore Mountain Ski Resort parking lot where the vehicle of missing Krista Dittmeyer was located. The police are not commenting on whether they have found anything located at the pond; however, they have cordoned off the area and moved the media away. Crews in New Hampshire cordoned off a snowmaking pond at a White Mountains ski resort on Wednesday in connection with the disappearance of Krista Dittmeyer, the Maine woman whose baby daughter was found abandoned in a car near this the weekend. Krista Dittmeyer’s vehicle was found Saturday morning in the parking lot of the Cranmore Mountain Ski Resort in North Conway, NH. Her 14 month old infant was found in the back seat unharmed as the car was idling and the hazard lights flashing. A rather odd circumstance if some one wanted to abandon a car. Why would the individual have left the car in a manner that would have brought attention to it. Police believe that Krista Dittmeyer was abducted and may be in danger; however, who ever did this wanted the car and the baby to be located. As reported at Fox News, the planned police press conference this afternoon has been canceled.Not always the best news when investigators are searching a specific area and confirmed that blood was found in the vehicle. However, Assistant Attorney General Jane Young would not comment on whether this was a homicide investigation or not. It would appear that the AG’s Office now is handling the case of missing 20 year old Krista Dittmeyer investigation. Investigators canceled a Wednesday afternoon press conference on Dittmeyer and referred all inquiries to the Attorney General’s Office. Assistant Attorney General Jane Young, one of the office’s homicide prosecutors, is in charge of the investigation. Young told FoxNews.com Wednesday she had “no comment” on whether the case was now a homicide investigation or if Dittmeyer’s body had been found. UPDATE I: It is also being reported that police are investigating a second vehicle found in Conway, NH. Conway police executed two search warrants, one warrant is for the Dittmeyer’s car, the other the police won’t reveal information about. However, police have seized a second vehicle in addition to Dittmeyer’s car, but they would not disclose the name of the person who owns the car. If any one has any information about missing Krista Dittmeyer or her whereabouts, please call the Conway Police Department 603-356-5715. More updates, comments and opinions can be seen at Scared Monkeys Missing Persons Forum: Krista Dittmeyer. UPDATE III: According to representative Jane Young of the Attorney General’s office, the body of Krista Dittmeyer was found in what locals call Duck Pond. An autopsy will be done Thursday. The death is labeled as suspicious. As reported at the Portland Press Herald, a hearse arrived at Cranmore Mountain ski resort in Conway, NH today at about 4:45 p.m. and left 15 minutes later. Our prayers go out to the family and friends of Krista Dittmeyer. May she rest in peace. 20 year old Krista Dittmeyer from Portland, Maine has disappeared. Her vehicle was found in the White Mountains of Conway, NH and her 14 month old baby was found in the back seat. The car was found abandoned at 6:30 am. Dittmeyer’s black Nissan Sentra had been spotted by a passer by with the engine idling and hazard lights blinking in the parking lot of the Cranmore Mountain Ski Resort. At 10:30 PM it is reported that the missing woman had talked to her mother via cell phone Friday night at about 9 pm. 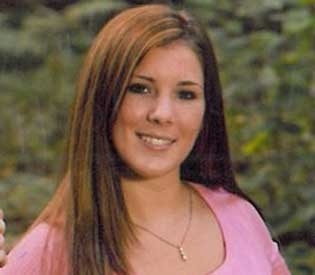 Krista Dittmeyer was reported missing on Saturday, April 23, 2011. The FBI has joined the investigation into the case of missing Krista Dittmeyer and a $3000 reward is being offered. Police have stated, “We have some substantial leads and we’re following up on each and every one of them:;” however, they are not commenting as to whether blood was found in the vehicle. Although, other investigators are saying that blood evidence was found in the missing woman’s vehicle. The missing 20 year old’s mom stated that Krista Dittmeyer had friends in Conway. Dittmeyer’s mother told the Herald Monday her daughter has friends in Conway and had been there before to visit the daughter of the ex-boyfriend who fathered her baby. She said the couple split in January. According toWLBZ2, the father of Dittmeyer’s child is a convicted drug dealer and is currently in prison serving four years in Maine. According the the Cumberland County Sheriff’s Department, 26 year-old Kyle Acker of Portland is serving an eighteen month prison sentence. He was convicted in July of last year for trafficking cocaine and marijuana. Acker’s last known address is the same as Dittmeyer’s.